Story: Ludwig Von Drake moved from Vienna, Austria, to Duckburg to meet his family. 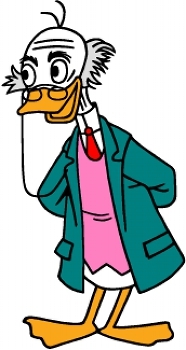 In Duckburg he settled down as a scientist and inventor. Background notes:The creation of Ludwig Von Drake was a coordinated effort between TV and creators of the comic strip for newspapers. According to the available information, Von Drake was mainly created for TV, and thus two of the creators are most likely Milt Banta and Otto Englander who wrote the script for An Adventure in Color. Information on the animator(s) of the cartoon has not been available, and no information on who created the visuals of the character has been available. As the character appeared for the first time in the comic strip the same day as the cartoon, there is a distinct possibility that Al Taliaferro, the artist on the comic strip, was involved. The first appearance in cartoons was as a host and announcer on Walt Disney's Wonderful World of Color. The show was a continuation of the show Disneyland, when it moved from ABC to NBC, after seven seasons, and went from black and white to colors. The Austrian professor with the German accent (voice by Paul Frees), appeared in the 15 episodes of the new show from 1961 to 1966, along with a cartoon named A Symposium On Popular Songs from 1962, and the TV version of Fun and Fancy Free from 1963 (the theatrical version is from 1947). After this, the character was not seen until Disney's DTV Valentine from 1986 (voice by Paul Frees). The following year, he appeared in two cartoons (voice by Albert Ash), and two episodes of DuckTales (voice by Corey Burton who is still doing the voice of Ludwig Von Drake today), and following a brief hiatus, he appeared in Raw Toonage episode 1 (1992), and became a regular on the series Bonkers (1993 - 1995), Quack Pack (1996), Mickey Mouse Works (1999 - 2000), House of Mouse (2001 - 2003) and Mickey Mouse Clubhouse (2006 - ). In the same period (1987 to the present) he has also appeared in a few other cartoons. In comics, he was introduced in the Donald Duck strip in the newspapers. His first appearance on September 24, 1961 was on a painting, and he was introduced as "the Professor". His first actual appearance was the following day, when he arrived in Duckburg. He was introduced as Donald Duck's uncle from Vienna, Austria, with no explanation of exactly how the two were related. The relationship was later revealed by Don Rosa, who had him married to Scrooge McDuck's sister, Matilda McDuck. He soon started appearing in the monthly books, and even had his own series for a while (4 issues, November-December 1961 through June-August 1962). A year after his first appearance, material with the good professor started being made in Italy, and the year after that, Brazil started producing stories. Other countries have produced stories with Ludwig Von Drake over the years, but mostly it was USA, Italy and Brazil from 1963 through the mid 1980s, after which it has been almost only Italian stories being produced. In games the first record found so far is Mickey’s Safari in Letterland (March 1993) for the NES platform or possibly Goofy's Hysterical History Tour, also from 1993, for the Sega Genesis platform. So far he has appeared in a handful of games, and being a regular in the cartoons, he will most likely appear in more games along the way. In terms of merchandise, he has also appeared in a number of items like figurines, stuffed toys, pins, coffee mugs etc.